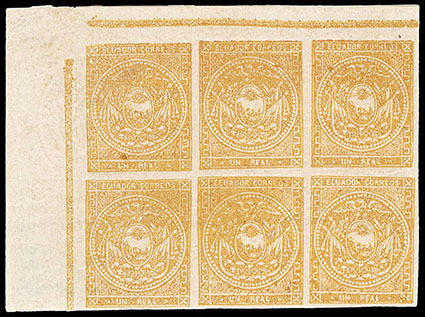 Ecuador, 1872, 1r Yellow Orange, Quadrille Paper, nine singles in shades; includes three in the yellow buff shades, one with left margin and partial rule, others with shades ranging from yellow to olive lemon, o.g., two without gum, mostly ample margins, two with creases, otherwise Very Fine. Scott No. 1 Estimate $100 - 150. 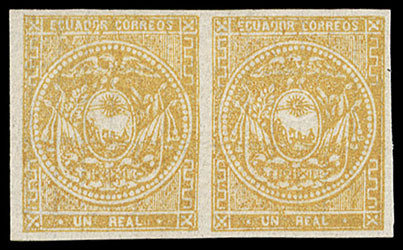 Ecuador, 1872, 1r Yellow Orange, Quadrille Paper, upper left corner margin single (position 1) and upper left corner margin block of six (positions 1-3/10-13), each bearing the embossed arms variety, full o.g., clear to ample margins, Very Fine, block of six regarded as largest unused multiple on quadrille paper with embossed arms. Scott No. 1, 1 var. Estimate $750 - 1,000. 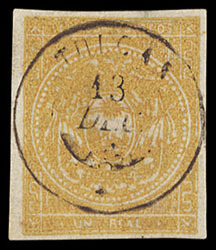 Ecuador, 1872, 1r Yellow Orange, Quadrille Paper, mint and used horizontal pairs; mint n.h. with full margins, used with indistinct town cancel and right stamp discolored, a Fine group. Scott No. 1 Estimate $50 - 75. Ecuador, 1872, 1r Yellow Buff, Quadrille Paper, socked-on-the-nose strike of brownish "Tulcan, 13 Dec" cds of Imbabura Province, ample to large margins, Very Fine, very scarce. Scott No. 1 Estimate $150 - 200. 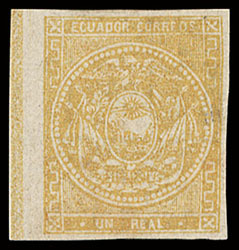 Ecuador, 1872, 1r Yellow Buff, Quadrille Paper, 3 horizontal pairs and single, tied on piece by red fancy "P.I." in star cancels with matching 1873 Quito cds, Very Fine and attractive. 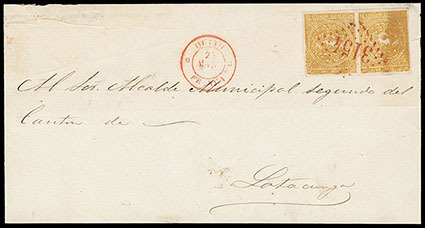 Ecuador, 1872, 1r Yellow Orange, Quadrille Paper, Horizontal Pair, oily impression, clear to large margins, tied by red "3154" dotted lozenge handstamp on cover front to Latacunga, matching "Quito, Franca, 27 Mar" cds, mostly likely 1873 usage as the French lozenge handstamp was put into use that year, Very Fine.